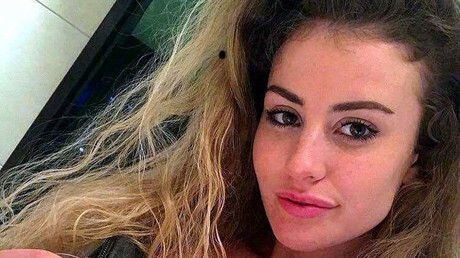 Chloe Ayling’s kidnapper has been jailed for 16 years; found guilty of kidnapping the aspiring British glamor model. Lukasz Herba, however, has insisted that he “loved” the model and that the abduction was a publicity stunt. Herba, who maintains his innocence and has already confirmed that he will appeal the sentence, was ordered to pay £60,000 ($ 80,300) damages to Ayling. The accused, who wore a grey hoodie and jeans in court, was sentenced to 16 years for drugging and kidnapping the mum-of-one. Ayling was lured to a Milan address on the pretext of a bogus modelling job. She was then held hostage for six days at a farmhouse before being released at the British consulate in Milan. Polish-born Herba, however, insists that the kidnapping was a set-up so the aspiring glamor model could star on reality TV and boost followers of her paid-for profile, through which she sold “spicy” photographs of herself for cash. “She wanted to be a model and she wanted to go on reality TV,” he said. “She said she wanted to raise her profile and that it would be useful to her career to create a scandal. She needed help and so I decided to help her. She had a site where if you paid money you could see spicy photographs. “She has no money so I said I would help her. I hoped that at the end she would remember me and we could be together. I loved her,” said Herba. “He is nothing of the sort,” Storari said. “He is a fantasist with narcissistic tendencies. Let’s not forget Chloe Ayling was put in a hold-all and kept in the boot of a car for five hours and could have died. “He treated Chloe not as a person but a thing. She could have been allergic to ketamine, she could have suffered from claustrophobia. She could have died,” he said. Storari closed his speech by asking the court to sentence Herba to 16 years in jail and boot him out when he is eventually released. Ayling’s lawyer Francecso Pesce said that the now-LA-based model was “terrified by what happened.” He added: “Yes, she was seen hand-in-hand with him shopping but she was in fear of her life and feared for her family,” he said. Pesce also ended his closing address to the court by asking them to sentence Herba to 16 years in jail, and to kick him out of Italy when he is eventually released. Ayling did not travel to Milan for the hearing. Herba’s lawyer Katia Kowlalovska confirmed that their team would launch an appeal against the ruling. “I hope to use evidence… which I was unable to produce at this trial,” she said. “Namely the fact that Chloe’s version when she was first questioned is very different to what she said later. “When I told him the sentence, he said he wanted to definitely go to appeal. He was hopeful that the court would have been lenient to him as he did not harm her and didn’t collect any ransom,” she told The Sun.